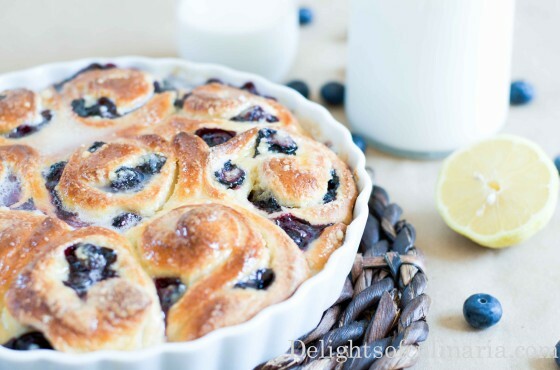 These blueberry lemon sticky buns are beyond delicious! They are super good,sticky,and fingerlicking.My kids loved them…my family members loved them…Im sure you’ll love them too. 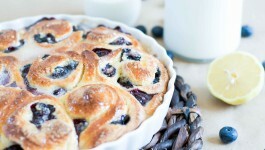 Perfect with cup of coffee in the morning.Kids liked them with milk, and great with hot cup of tea as well. **Most European/Russian stores and Winco Foods carry it. Add sugar to milk.Stir until sugar disolves.Stir in yeast and 1/2 cup flour and set aside. In another mixing bowl whisk with hand blender eggs,cream cheese,sour cream,oil,salt,vanilla. Whisk in milk mixture to egg mixture. Whisk in butter.Add rest of the flour,and transfer dough mixture to bread maker. Set your setting on “dough”. 2.Whisk in butter.Transfer mixture to stand mixer bowl. 4.Mix dough with hook attachment.Starting on med-low speed and increasing speed gradually to highest. 5.Cover bowl with plastic wrap.Place the bowl in the warmest place in your house covered with blanket or towel. I like to place it in the microwave(don’t turn it on!). 6.Let dough rise,about 2 +/- hours. In a mixing bowl, combine lemon zest and sugar. Rub sugar and lemon zest using your hands. Pour in butter and rub the mixture with your hands to create crumbs. Butter or grease 2 small or 1 large baking pans/dish. 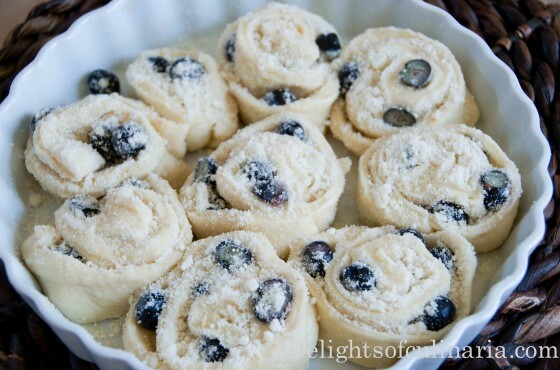 Roll the dough into large thin ractangle. Brush on a thin layer of melted butter or spread evenly using your fingers. 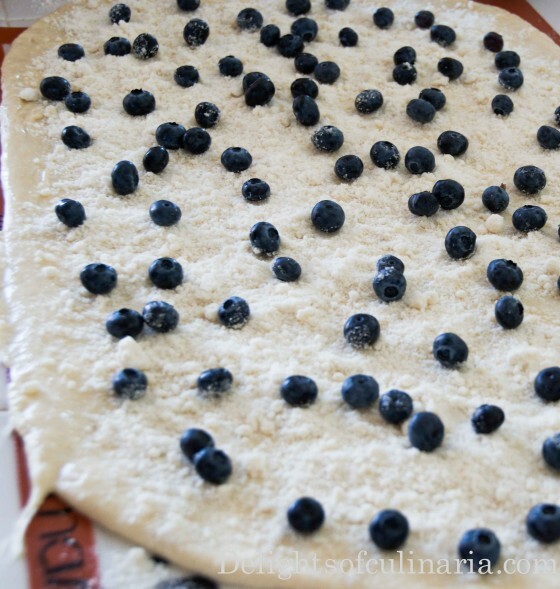 Sprinkle the filling mixture over buttered dough. 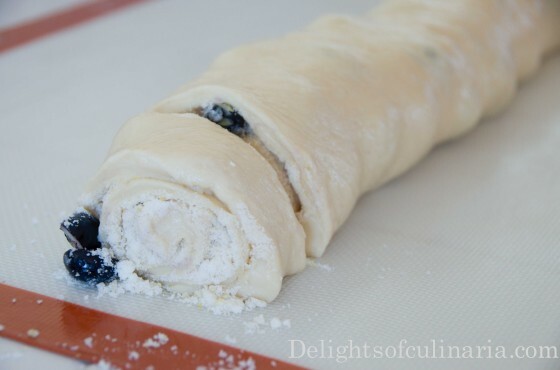 Sprinkle blueberries over crumb mixture.Roll the dough into a log.Pinch the edges and seal the seams. Slice the roll into 1 inch slice.Arrange pieces onto buttered pans. Cover with kitchen towel and allow to rise for about 20 minutes. Take it outside during summer for quicker better rise. Whisk egg and water together and brush on buns. Bake for 25-30 minutes or until they are deep golden brown. 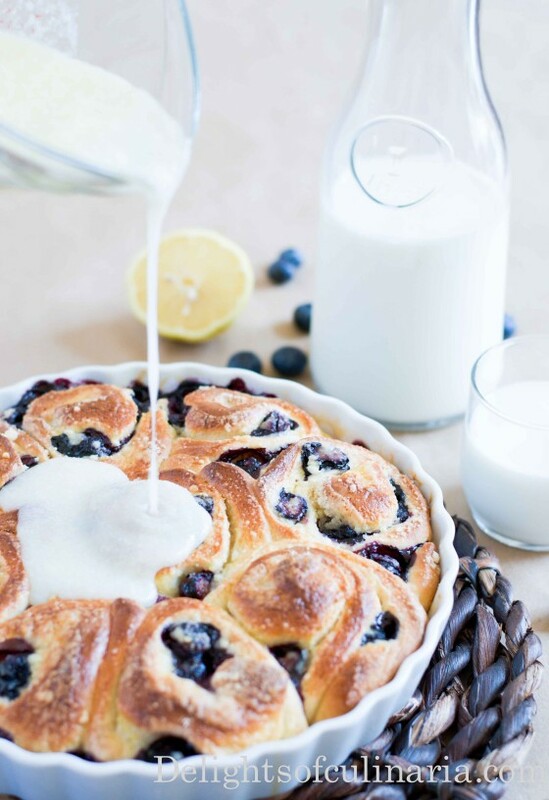 Glaze- Combine all ingredients together using a whisk. Remove buns from oven and pour the glaze over them while hot. Set your setting on "dough". I like to place it in the microwave(don't turn it on! ).